The solar system is spread apart into warring fiefdoms, technology has gone by the wayside and become an extreme luxury, education is fleeting and knowledge is reserved for the powerful – meaning science and medicine lag behind. Religion and superstition reign. This is a campaign setting that’s deeply entrenched in superstition and subverted ideals, despite the staggering height of technology. Dark Astral is the Renaissance era transplanted into the theater of the Vault of Night: foolhardy Shadowbrokers, corrupted Klergists, insane Psykonauts, hedonistic Technokrats, sanguine Manhunters and ravaged Astrotemplars all have their niche, even if their sailing ships are replaced by space arks and bows with laser rifles. In Dark Astral, we don’t use traditional science fiction terms: aliens are called The Other, gravity is called Ætherea, planets are called Dominions, spaceships are called Arks, stars are called Mirrors and space itself is called the Vault of Night. In the uncharted territories in the Vault of Night, there are not galaxies, but Wytch-spirals. Steeped in superstition and living in the wake of lost technology, Characters will struggle against the grim spectre of a corruptive force from beyond - deep within the Dark Astral! Within this 32-page PDF, you're going to find a new approach to use Zweihänder Grim & Perilous RPG at your game table. Dark Astral is the first of a new series of chapbooks, where we've taken the base #ZweihanderRPG rules and cast them through the lens of a Biblically-inspired, pseudo future of 'Spacehander'. Dark Astral is a little bit of Alejandro Jodorowsky's unrealized take on Dune, mixed with a healthy influence of Xenogears and the gritty science fantasy of the first edition of Rogue Trader. We've included a comprehensive equipment list, including a ton of new weapons, armor, technological trappings and Qualities that apply to them. You'll also find technical ideas around how to use #ZweihanderRPG core Professions in this chapbook, accompanied by Moebius-styled artwork drawn by Ken Duquet! Most importantly, everything you see in Dark Astral is perfectly compatible with Zweihänder Grim & Perilous RPG. A chapbook is an experiment on how we deliver future supplements for Zweihänder Grim & Perilous RPG. It is meant as a tasting room; we're setting the table with some new recipes, and we want to hear from you on how you like them. 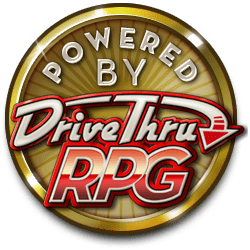 Our chapbooks are intended to be released exclusively on DriveThruRPG in PDF format, and eventually for print-on-demand. You can also think of our chapbook as a 'skunkworks' of sorts; a place to run with new rules and ideas from our game table to yours. We want to hear about your experiences with Dark Astral on social media (using the hashtags #Spacehander and #DarkAstral). Based on what we hear, we may turn Dark Astral into a full-blown supplement. One of the key components of the chapbook series is to listen to you: what you like, don't like, etc. We will take under consideration community feedback, refactor where needed, blow out new options and provide a more expansive treatment should it prove to be popular with #ZweihanderRPG fans. So come along with us and join this crazy ride with our first chapbook, which we're calling Dark Astral! As featured on Forbes, ranked in the top 20 best selling, Adamantine Rated on DriveThruRPG and having sold over 26,000 physical copies and 62,000 digital copies worldwide, ZWEIHÄNDER Grim & Perilous RPG is a bloodier, grimmer and grittier version of classic tabletop role-playing games you may already familiar with. The community calls this style of gaming the “pathetic aesthetic”, but we simply call it grim & perilous gaming. I noticed that this can be printed as softcover black and white or softcover color. Would the color make a difference? I was under the impression the all the art was in black and white anyway. So I just picked this up and perhaps I'm missing something... But this is just a straight trip from Warhammer 40k, correct? This is just WH40k with another name? I'm fine with that but it seems almost a little too on the nose. ZWEIHANDER is obviously a baroque system and takes most of its inspiration from the earlier editions of the Warhammer Fantasy RPG but I was hoping this would be something different. It is not. I have been inspired by this. Granted their isn't a load of content but what it contains has triggered my own imagination . Spacehander will be something to behold. This taster is worth your while if your looking at getting your creative juices flowing. May your cup runneth over. I'm going to hold off giving this one an official review for a bit in hopes that it gets more attention in the Discussion section. I dig it so far, but it feels a bit incomplete. I would be far more likely to play something like this than the "old worlde" style Zweihander. And, Zweihander is cool as well, but I know my tastes and interest run far more towards the grimdark space opera influences of this game. So, this might be pie in the sky wishing, but I would like to see this little chapbook married to a concise ruleset with a few race/class profiles. I'm not a fan of DH and the recent RT. Those recent publications are good efforts and have lots of interesting fluff, but the systems are too arcane for me. Back in the day, we played the original RT as an RPG. It wasn't perfect, but it worked. There was minimal rules (oldskool means rulings not rules) and lots of fluff plus tables and art galore. It was simple and inspiring. I hope this product takes further inspiration from Codex Imperialis and the...See more original RT. 1.) A handful of profiles and expanded fluff representing the typical folks of each faction. 2.) More detail on the weapon, armor, gear. Right now it seems more like the back of an army book. Too barebones by far. Needs more art and more fluff. 3.) Mutations! D1000 mutation lists ala the oldskool RoC books (especially StD). 4.) Robots. While most of my focus so far has been praising the original RT era, it would be nice to see better Robot rules. 5.) Tables for inspiration. What are the worlds like? What are the threats?